As we all know, times are changing faster than shoe trends and today one aspect of women and men in business is the growing success of women in the workforce. More women are able to attain top positions such as CEO and CFO at some of the biggest companies in the nation. It’s hard to believe that a long long time ago, this was not only not possible but also uncommon and viewed as unacceptable in society. Furthermore, for most of our parents, women going out after college and finding jobs and paths and fulfilling goals (work related) wasn’t the most common thing, actually it was more rare than it was common. For women born before 1965 more women were searching high and low for their soulmate, not like today’s soulmate which many consider their job. So as I see more women climb to the top both in school and in their jobs I can’t help but notice how some men are handling this change. I remember once in college a guy joked about me studying domestic engineering in school. Ha… ha… ha. Funny thing is, that guy was a pretty decent person and smart but he made himself look like a total donkey douche.. I’ll never forget the nights I remember laughing and chatting with my girls about how that guy would end up marrying the perfect domestic engineer/ housewife… and she would eventually cheat on him out of boredom and take all of his money. Yes, sorry guys, this is what we sometimes talk about when you headline any of our books. So anyways, how I have come to understand men just from interacting with those of this sort and those of the complete opposite, is that every man who say they are looking for a perfect housewife/ baby-maker, are really masking the fact that being with a successful woman would damper their ego and send them into a constant insecure frenzy. Now the guys who find it extremely interesting when they come across a woman that can offer them more than just scrambled eggs and a color coordinated closet, they are the ones you want to keep on your radar. Whether you win the lottery tomorrow or cash in your stocks after you double up or end up selling your newest novel in five other countries, this man will be by your side; proud, all the way. Sometimes it has to do with how a guy is raised and whether he saw his mom at home his whole life, never once lifting a finger to make a dollar. Other times it has to do with how society has drilled into the brains of every man, how masculinity comes with strength, courage and success. In order to feel like the man, some men HAVE to be the sole providers, even if this means putting down their wives and sending them off to the mall, gym and grocery store. If you are having trouble following what I am saying (men) or are sitting at your computer reading this, cursing about how I am the one who doesn’t understand men and “don’t know anything” I have made up an example for you. So for example let’s just say there is a big social gathering honoring some very successful people. Of attendees, there is Man A and his wife and Man B and his wife. Man A is an accountant, social, well-liked and very good looking, he attends with his wife a well known attorney, very smart, outgoing and gorgeous. Now Man B is a very successful investment banker, has been featured in Forbes and is also very good looking, he also attends with his wife who doesn’t work but does work out often and is the queen when it comes to fashion and beauty and is also gorgeous. What man do you think is going to be seen as a greater prize, Man A or Man B? Man A has an investment, Man B has a liability. You do the math. If you are one of the guys that truly looks for a woman that you can learn from instead of just teach, good for you! And I am not just talking about in the bedroom. You know I’m not telling you to go out there and find a woman to take care of YOU, but find your equal. Anything less, we all know- will only bring you down. If you do happen to have this egomaniac streak in which you notice a pattern of only dating women who want to do nothing with their lives, what you need to think about is your future. Every guy comes from a very different background. There are some of you who feel the need to take care of a woman, which is absolutely fantastic, we want to be taken care of! But what I am saying for you is find a woman that has her own life too. Think about ten years from now, yes that’s a long way off for most of you, but in the next ten years, women are not going to retreat home, instead they may end up taking over more than they have now. Hey, just saying. So in ten years what would you rather have, a woman that will seem more like carry on luggage or a checked in suitcase. One that you have to take responsibility for and drag around your whole life or one that you don’t have to worry about, one that you know is safe just because of the name they made themselves? 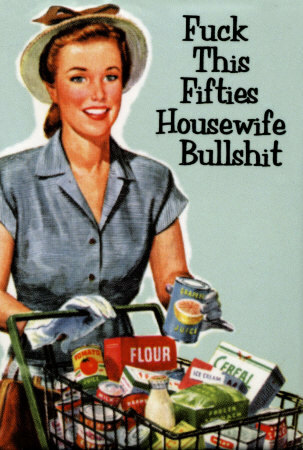 They are no longer called "Domestic Housewives" they are "Desperate Housewives" ... for a reason. Desperate for your money. I am a older successful woman and yes my husband was an advocate of mine.We were advocates of each other. I was born well before 1950 AND my mother received a college education in the twenties….that is how far back we EDUCATED women go. Perhaps the college guy teasing gals about studying domestic engineering has a small ____ so he has to make it up by putting women down. Finding the right partner in my opinion is not about your title, it is about communication and love. Maybe you should write the script for the “Desperate Housemen”!